Snapchat has been losing a lot of users for quite sometime now. It initially started when Instagram copied the "story" feature which used to exclusive to Snapchat only. This resulted in a steady decrease in the number of Snapchat's active users. After that, there have been series of other controversies which has affected the company negatively. Not long ago, the company changed its UI on iOS, which made a lot of angry Snapchat iOS users to circulate a petition demanding that the old UI be brought back which actually didn't happen. Now, the company has just been hit by yet another major controversy. 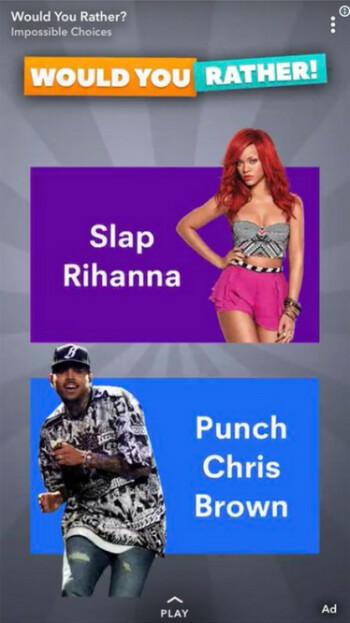 Snapchat recently ran an ad on its app asking whether users "would rather slap Rihanna or punch Chris Brown." For those who don't remember, Rihanna suffered domestic violence back then in 2009 when Chris Brown was convicted for brutally attacking her in a car. The ad didn't go down well with a lot of subscribers as they took to Twitter to express their displeasure with many threating to delete the app from their phone. "You already know you ain't my fav app out there! You spent money to animate something that would intentionally bring shame to DV (domestic violence) victims and made a joke of it!! !...Shame on you." "We are so sorry we made the terrible mistake of allowing it through our review process. We are investigating how that happened so that we can make sure it never happens again." Investors also took sides today as Snapchat parent SNAP saw its stock slide as much as 5% to hit a low of $16.91 before rebounding to close at $17.20, off 3.6% on the day.